Alex Aitken at The Jetty, formerly Gary Rhodes restaurant, Rhodes South is set in the grounds of the elegant Grade II listed Christchurch Harbour Hotel. The contemporary, custom-built eco-friendly building was designed by Baufritz architects, using materials specifically chosen for their carbon-neutral qualities. 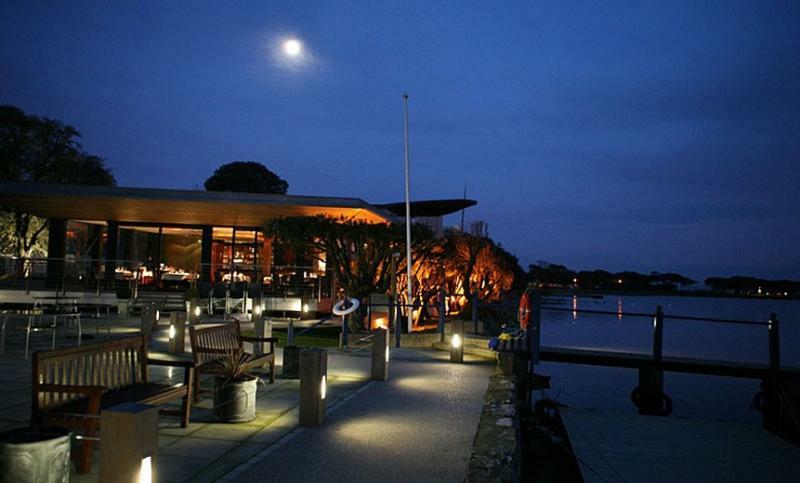 Sitting on the water's edge with stunning views of the landscape and overlooking Mudeford estuary across to Hengistbury Head, the restaurant blends in beautifully with the local scenery to create a sensitive, yet striking vista. The interior is decorated with neutral colours, with simply laid dark wood tables and chairs, a viewing window to the kitchen and floor to ceiling windows to take in the views. The kitchen is under the leadership of Alex Aitken who used to own Michelin starred restaurant Le Poussin in Brockenhurst. There is an abundance of supplies available to produce their locally sourced sustainable dishes, with fish supplied daily from Mudeford Quay including Dorset rock oysters and Christchurch Bay lobster. Open proceedings with a classic Mudeford crab on toast or boned quail with chicken mousse and foie gras baked in a pie. Follow on with fillet of cod with seared scallops, mashed potato, green beans and bacon sauce or maybe one of the specials Barnsley lamb chop, grilled in the josper charcoal grill that imparts delicate wood smoke flavours, served with ratatouille. Lovely desserts round things off with the Jetty tiramisu and coffee ice cream or poached pear with lemon and vanilla syrup and strawberry ice-cream. The wine list is an international slate featuring a good spread from across the world, with some offerings available by the glass. This is an unrivalled destination to dine al fresco during the summer months, when you can watch the sun setting over the idyllic views. We know everyone loves their greens ask what we have today!